The total value of world production of Physical Security products at factory gate prices in 2018 was $31.55Bn, an increase of 8% on 2017. This is an increase of approx. 1% over the Compound Annual Growth Rate (CAGR) of 6.87% during the last 4 years. We are forecasting the market will reach $51.38Bn by 2023. Of this, the world market for Video Surveillance products should grow at a CAGR of 13.43% to 2023. The reason for this is the demand for AI Video Analytics that should gradually be taken up over the next 5 years having the potential to add a further $2.3Bn to the video surveillance market in 2023. AI Video Analytics will be the number one game changer over the next 10 years in the video surveillance business, influencing the growth of most products that make up this business. The developed markets of North America and Europe are losing global market share to Asia and particularly China. This is expected to continue to at least the end of the decade which is bad news for western manufacturers of Video surveillance products because they have failed to establish a solid business base and significant share in China; whilst 2 Chinese manufacturers have sales of more than $5 billion between them and now have the kind of scale that allows them to reduce prices to the levels that most western manufacturers can’t compete against. There are 4 regions in the world that make up over 80% of the world’s physical security business. Of these we estimate that China accounts for approximately 31%. We estimate China is now the biggest single country market for physical security products having increased its share by almost 50% in the last 7 years. Video surveillance equipment has been the major contributor here. The Chinese market has grown rapidly through a boom in new construction and Safe City projects in the public sector. However very little of this vast expanding market has been of benefit to western manufacturers. We identify 14 companies (Group A Companies, who have revenue over $1Bn) accounting for some $17.95 billion in product revenues in 2018. The inclusion of Hikvision and Dahua and this year Axis Communications has given new impetus to this group and the merger between Thales and Gemalto has produced a new mega Identity Management / Access Control biometrics company. The net effect of this is that this group has significantly increased its contribution and the average sales revenue is $1,282m giving them 57% share of the physical security market. In the report, we compare the performance of 16 different vertical markets in 2006 with 2018 and this shows there have been some significant changes during the last 10 years. The transport sector has almost doubled its share and at 16% is now the largest vertical. Many new opportunities have opened up, particularly for video surveillance, driven by the threat of terrorism and the need to improve safety and efficiency of traffic movements. Retail is the next largest sector with an 11.5% share. This vertical has shown how convergence with the business enterprise can improve the bottom line and is now regarded as an operational revenue saver by many of the world’s major retail companies. VSaaS (Video Surveillance as a Service) has at last broken through the $1Bn barrier and is forecast to reach the $1.2Bn sales by the end of this year. Strong growth over the last 12 months has pushed hardware sales up by at least 50% and most forecasts predict demand will grow at a GAGR of 20% to 2023. There are a number of reasons for this. The first is that the supply side has put more effort and investment into providing VSaaS and ACaaS (Access Control as a Service) services and technology has overcome many limitations and reduced service costs. At the same time they are winning over system integrators to adopt cloud services and this has also provided a significant boost to growth. Access Control is still a much smaller business than Video Surveillance and today is far less competitive, but consolidation is creating a more competitive environment and with it comes the confidence to move forward and take up the challenge of embracing new technologies that will deliver better performing products necessary to continue cranking up demand. If manufactures prefer to continue to be insular and proprietary, it will not be good news for continued growth, for traditional proprietary systems mean limited options for the customer and restricted possibilities for integration and scalability. 2018 is the year that all the stakeholders in the Physical Security Industry finally got the message that the Cyber Security threat was capable of causing untold harm to their business. Now one of the critical buying propositions of physical security is “What have you done to make this equipment less vulnerable to cyber attack”? The owners and operators of buildings, particularly those having large building estates need to know that manufacturers and installers fully understand what needs to be done to reduce vulnerability and make sure it is applied to their equipment and systems. The report also shows the full history of M&A activity since 2000. In 2018, mergers and acquisition activity in Physical Security totaled $7.33Bn (16% up on 2017), which looks like the start of a new wave of growth. The structure of the industry is still very fragmented with hundreds of small companies finding it increasingly difficult to compete and it looks inevitable that the general trend line of value and volume of mergers and acquisitions will continue upwards over the next 5 years, but at a modest growth rate. The average value of a deal has increased from $100m in 2010 to $150 million in 2015 and in 2017 the average deal was $168 million. This year (2018) adjusting for the non-Physical Security business of the Gemalto acquisition the average deal was around $160 million. The number of deals in the range of $50m to $150 has increased and there has been more diversity across the different product types. Cross border acquisition accounted for 24% of the deals carried out this year. For the most part over the past 5 year period the main driver has been the need to extend geographic coverage but this year acquisition of technology has been the main objective. Some 62% of the deals involved the acquisition of US companies with the vast majority being domestic affairs. Starting at only USD $1,750 for a Single User License, this report provides valuable information into how Physical Security companies can develop their business strategy through Merger, Acquisition and Alliance. 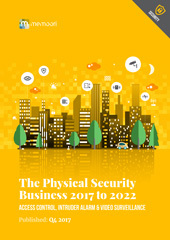 The information contained in this report will be of value to all those engaged in managing, operating and investing in physical security companies (and their advisors) around the world. In particular those wishing to acquire, merge, sell or find alliance partners will find its contents particularly useful. Is Physical Security Industry is the Weakest Link in the BIoT Chain? Do Chinese Manufacturers Dominate the Video Surveillance Business?